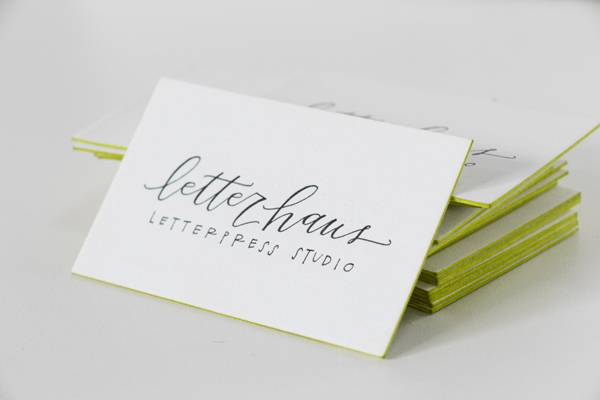 When you step over the threshold and into the clean, modern interior of Letter Haus, the alluring smell of printing ink and cheery natural light filtering in above through the windows draws you in further to an elegant display of letterpress and passion. 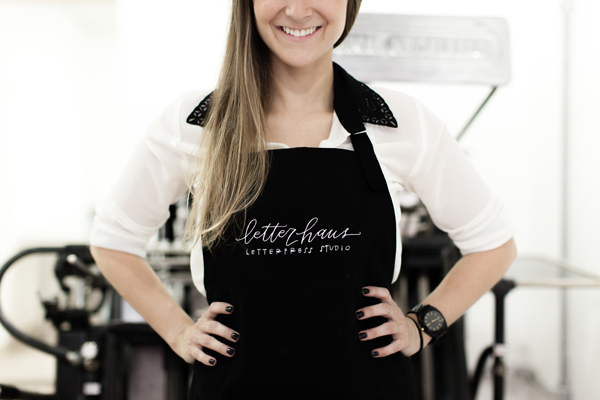 Lillian Barbosa, of Belo Horizonte, Brazil gives us a tour of the cozy space and remarks on her letterpress journey from blogging about the want of having a dream job to realizing it full force. 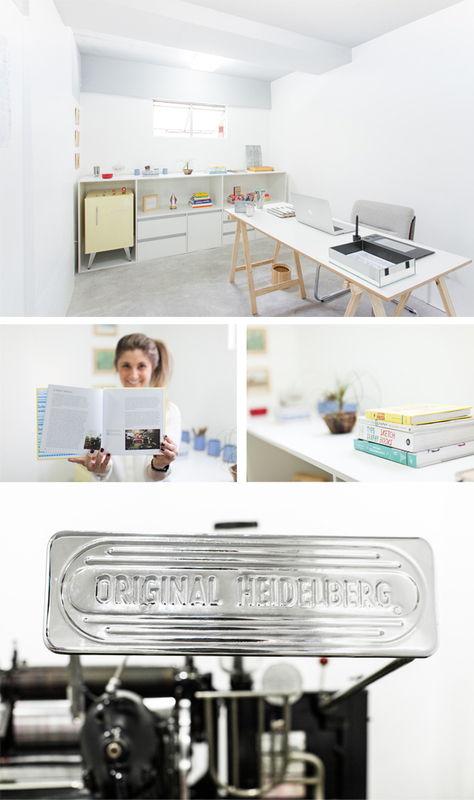 FINDING LETTEPRESS Hi! I’m Lilian. I’m from Brazil. Born in Rio, lived 15 years in São Paulo, and now am living in Belo Horizonte. I studied advertising in college and then worked for two years as an art director at an ad agency. In 2012, a friend and I started a blog about people who gave up their unhappy professional life to chase their dream jobs: we interview people who graduated with a certain degree, worked and found out that it wasn’t what made them happy, so they decided to leave everything behind to follow their hearts and found work that fulfilled them. With the blog going on, last year I found out that what I was doing wasn’t making me happy, so I decided to look for what I really wanted. Then I found letterpress. LOVE AT FIRST SIGHT I fell in love with the art, the beauty and what printing represents to people. So I decided to research a little bit about it: the presses, the material, paint, paper, everything. I found a beautiful Heidelberg Windmill here in my city. In January I bought it! For 2 months I had a printer to teach me how to setup my press, but now I’m on my own and I’m having a lot of fun! BEAUTY IN BRAZIL I found a place in an 8-store gallery next to my house in a really nice neighborhood with a lot of trees, nice houses and stores that was perfect for my press & me. It has a mezzanine where I made my office, and the production floor is downstairs. At the back I have a room that stores paper, ink, oil, tools and all the messy stuff! PRINTING INSPIRATION I got really inspired when I was about to start my letterpress business with all studios I could find and follow on the internet. A special thanks to you guys at Boxcar, 9th Letterpress, Sugar Paper LA, Press Haus La, Studio On Fire, Iron Curtain, Printerette, Clove St. Press, Ladyfingers, 1canoe2, The Hungry Workshop, Thimble Press, Bespoke Press, The Alphabet Press, Ink Meets Paper, Gus & Ruby, and many more. You guys don’t know me, but you were really important! 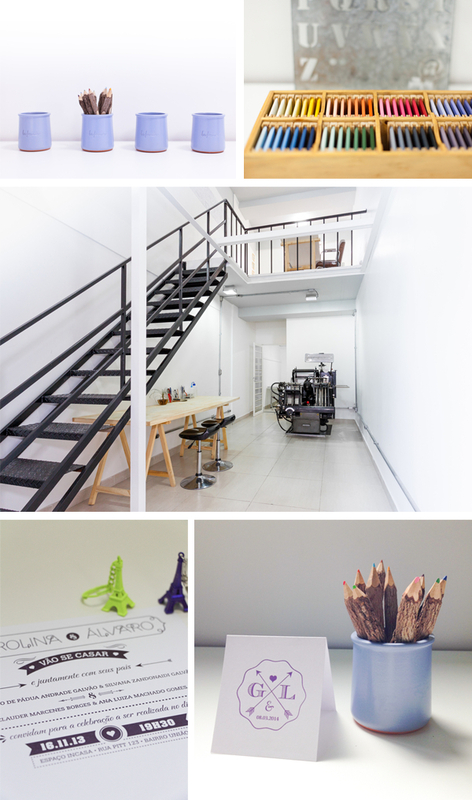 In Brazil we don’t have as many studios as you have in the US, so I found really beautiful prints, cards, wedding suits, and decided to create beautiful things as well! DESIGNED FOR PRINT I’m the woman in a one-man studio! 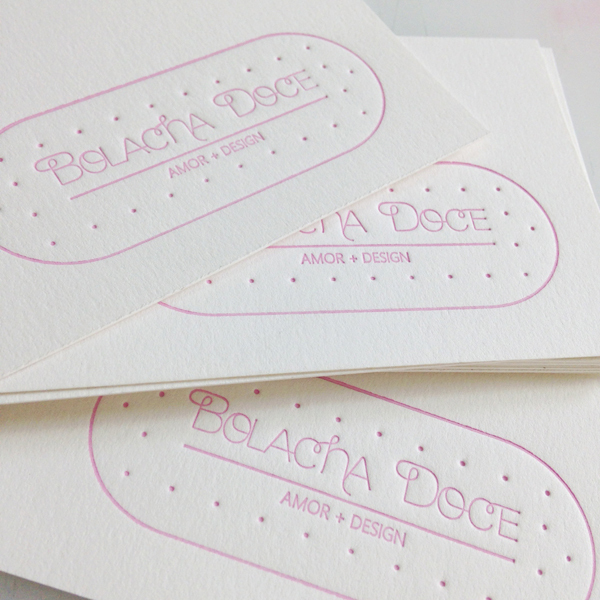 I create when the clients don’t have their design, I answer e-mails, I print, buy supplies, everything! When I design, I always try to meet with the person over at my studio, we find references, and I create based on our talks as well as on the event or the person’s style. FULL TIME FUN I do print full time. It’s been 4 months already since it all got setup here at the studio and it’s been a really fun challenge! PRINTING FEATS I’m really proud to have my studio opened. It’s been a lot of work and improves everyday. 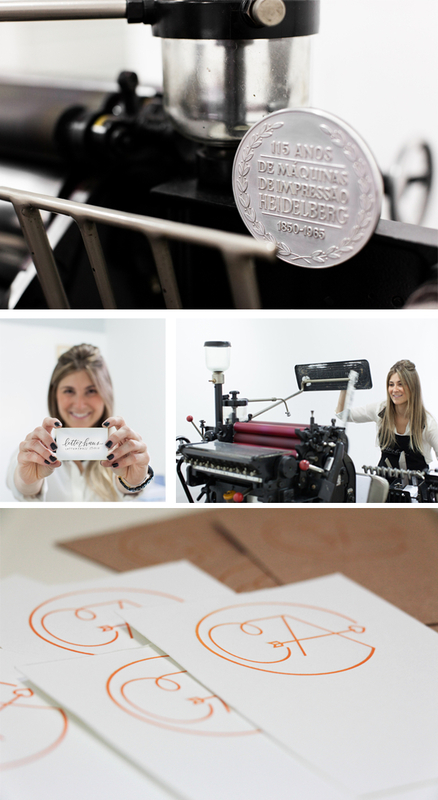 Since I’m new to the letterpress business everyday is a new challenge – a hardworking, but rewarding challenge! PRESS HISTORY My first was my Heidelberg Windmill. This complex beast prints beautifully. I’m loving it! BOXCAR’S ROLE When I got my press I was a little bit lost and by reading some of the posts on your blog I got a lot more confident with my business. Your videos made me understand when at the time it didn’t make any sense to me. And just knowing that if I have any questions you guys will happily answer me is a relief. Letterpress Commons also came up and with the studio map I’m actually planning a letterpress trip! SHOP TIPS Pay attention! Always. Listen to the press’s noises, its movements, and understand all of its German mechanics. Try to keep your hands clean and don’t panic when something is not going the way you expect. Try to keep focused, put some nice music on and start over. WHAT’S NEXT Hopefully 2015 will be an awesome year, I’m planning on going to NY to meet some printers over at NSS. I’m creating greeting cards lines with really nice partners and I expect to print beautiful invitations, business cards, and stationery. I’m looking forward to have a nice year full of colors and prints! Huge round of thanks & applause out to Lillian for letting catch a glimpse at Letter Haus! 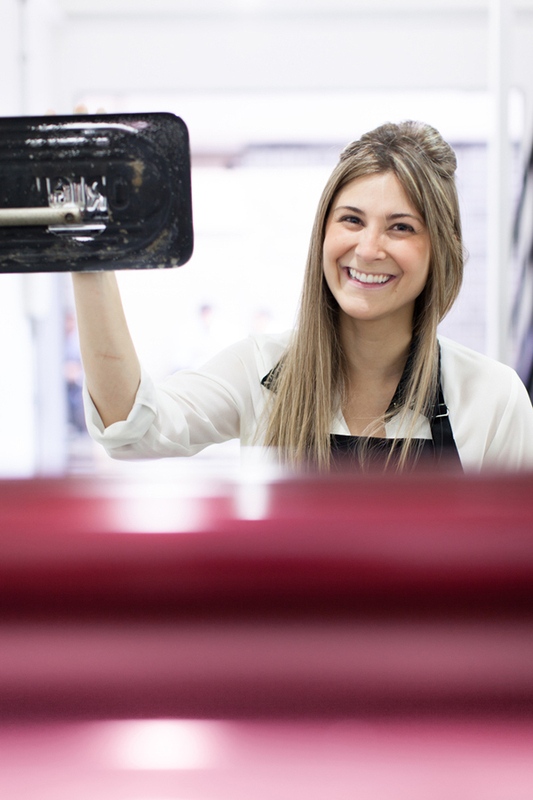 This entry was posted in Printer Profiles, Shop Talk by Rebecca Miller. Bookmark the permalink.